We’re happy to announce another new feature. This one’s been heavily requested for quite a while but for various reasons we didn’t get to it until now. It’s now possible to instantly duplicate any sub-list in WorkFlowy. This is useful when you have a template that you want to duplicate multiple times (say for each customer of your business), or if you have a checklist that you need to complete repeatedly. 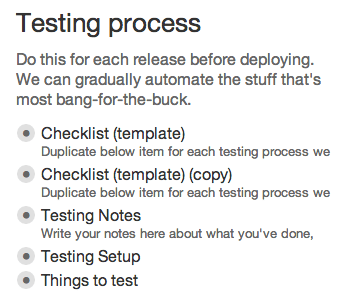 Here in WorkFlowy land, we have a release checklist that includes a testing process. We run tests for every platform that WorkFlowy can run on before releasing a new version. 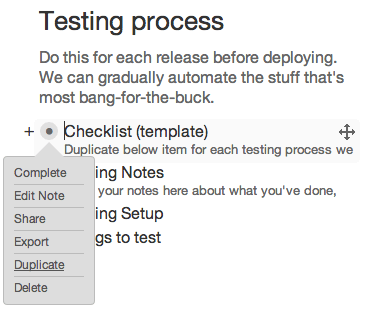 We have a template for the testing process that contains a section for notes and a checklist for the platforms we need to test on. With the new duplication feature, we can simply duplicate the template. To duplicate a list, hover over its bullet to bring up the control menu, move to the down arrow to show the additional controls, and then click “Duplicate”. Then it’s simply a matter of changing the name of the duplicate (in our case, to something like “Testing checklist – May 16th, 2012”), moving it to where it needs to be, and actually completing the process. We hope this speeds up anything you find yourself doing repeatedly in WorkFlowy, and we’ll see you next time. Is there anyway to perform this function using the iPhone app? I wish it would not add that “(copy)” thing. 9 times on 10 I go to delete it.